Not that I speak in respect of want: for I have learned, in whatsoever state I am, therewith to be content. Paul the Apostle as written in Phil. 4:11. Discontent! Was there ever a time when there was so much restlessness in the world as there is today? We very much doubt it. Despite our boasted progress, the vast increase of wealth, the time and money expended daily in pleasure, discontent is everywhere. No class is exempt. Everything is in a state of flux, and almost everybody is dissatisfied. Many even among God's own people are affected with the evil spirit of this age. Contentment! Is such a thing realizable, or is it nothing more than a beautiful ideal, a mere dream of the poet? Is it attainable on earth or is it restricted to the inhabitants of heaven? If practicable here and now, may it be retained, or are a few brief moments or hours of contentment the most that we may expect in this life? Such questions as these find answer, an answer at least, in the words of the apostle Paul: "Not that I speak in respect of want: for I have learned, in whatsoever state I am, therewith to be content" (Phil. 4:11). The force of the apostle's statement will be better appreciated if his condition and circumstances at the time he made it be kept in mind. 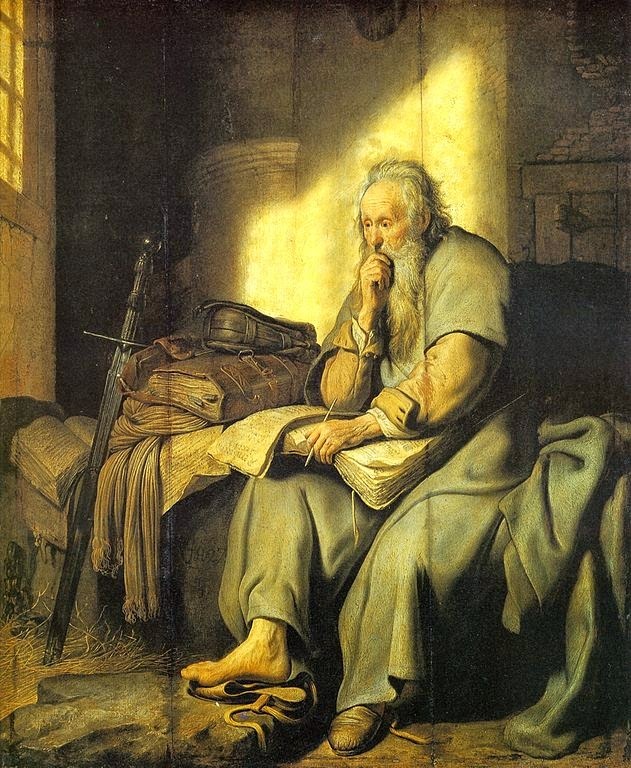 When the apostle wrote (or most probably dictated) the words, he was not luxuriating in a special suite in the Emperor's palace, nor was he being entertained in some exceptional Christian household, the members of which were marked by unusual piety. Instead, he was "in bonds" (cf. Phil. 1:13, 14); "a prisoner" (Eph. 4:1), as he says in another Epistle. And yet, notwithstanding, he declared he was content! Now, there is a vast difference between precept and practice, between the ideal and the realization. But in the case of the apostle Paul contentment was an actual experience, and one that must have been continuous, for he says, "in whatsoever state I am." How then did Paul enter into this experience, and of what did the experience consist? The reply to the first question is to be found in the word, "I have learned . . . to be content." The apostle did not say, "I have received the baptism of the Spirit, and therefore contentment is mine." Nor did he attribute this blessing to his perfect "consecration." Equally plain is it that it was not the outcome of natural disposition or temperament. It is something he had learned in the school of Christian experience. It should be noted, too, that this statement is found in an Epistle which the apostle wrote near the close of his earthly career! But let us endeavor to go a little deeper. What is "contentment"? It is the being satisfied with the sovereign dispensations of God's providence. It is the opposite of murmuring, which is the spirit of rebellion-the clay saying to the Potter, "Why hast Thou made me thus?" Instead of complaining at his lot, a contented man is thankful that his condition and circumstances are no worse than they are. Instead of greedily desiring something more than the supply of his present need, he rejoices that God still cares for him. Such an one is "content" with such as he has (Heb. 13:5). "Godliness with contentment is great gain" (I Tim. 6:6). Negatively, it delivers from worry and fretfulness, from avarice and selfishness. Positively, it leaves us free to enjoy what God has given us. What a contrast is found in the word which follows-"But they that will be (desire to be) rich fall into temptation and a snare, and into many foolish and hurtful lusts, which drown men in destruction and perdition. For the love of money is the root of all evil: which while some coveted after, they have erred from the faith, and pierced themselves through with many sorrows" (I Tim. 6:9,10). May the Lord in His grace deliver us from the spirit of this world, and make us to be "content with such things as we have." Contentment, then, is the product of a heart resting in God. It is the soul's enjoyment of that peace which passeth all understanding. It is the outcome of my will being brought into subjection to the Divine will. It is the blessed assurance that God doeth all things well, and is, even now, making all things work together for my ultimate good. This experience has to be "learned" by "proving what is that good, and acceptable, and perfect, will of God" (Rom. 12:2). Contentment is possible only as we cultivate and maintain that attitude of accepting everything which enters our lives as coming from the Hand of Him who is too wise to err, and too loving to cause one of His children a needless tear. Let our final word be this: real contentment is only possible by being much in the presence of the Lord Jesus. This comes out clearly in the verses which follow our opening text; "I know both how to be abased, and I know how to abound: everywhere and in all things I am instructed both to be full and to be hungry, both to abound and suffer need. I can do all things through Christ which strengthens me" (Phil. 4:12, 13). It is only by cultivating intimacy with that One who was never discontent that we shall be delivered from the sin of complaining. It is only by daily fellowship with Him Who ever delighted in the Father's will that we shall learn the secret of contentment.